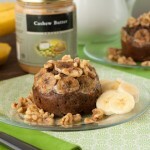 A mini gluten-free banana bread for one! It’s higher in protein and fiber than your average cake making it a perfect light snack, treat, or breakfast. Cut banana half in two. Thinly slice one portion and set aside and mash the other portion. 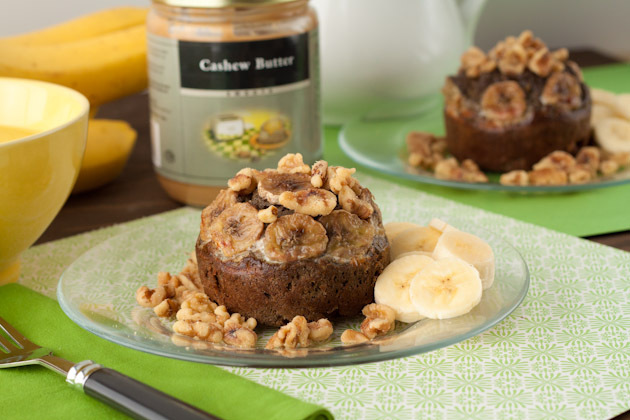 Combine all ingredients but sliced banana in a small bowl and mix until fully incorporated. Drop mixture into a well oiled (I used a dab of extra virgin coconut oil) ~250mL (1 cup) oven safe ramekin. Top with banana slices. Place in the preheated oven and bake for 24-26 minutes, or until a toothpick inserted comes out clean. My cakes were done at the 25 minute mark. I have not tried to make this cake vegan, but many readers have told me that subbing out the egg white for a flax egg (1 tablespoon freshly ground flax + 2 tablespoon warm water mixed and allowed to sit for 5 minutes) works well in other versions of my protein cakes. I like my cakes with 10 drops of stevia, but it really comes down to personal preference. If you don’t like stevia, 1 tablespoon of xylitol, coconut sugar, date sugar, etc will work, too.